As a child, did you ever pick up a stone, rub your wet thumb over its surface to reveal the colours, feel the satisfying heft and shape of it in your palm, and then carry it around in your pocket? Before long, you may have forgotten about it, lost it or discarded it. Or you may have put it on a window sill where the light could catch its pattern or colours, or you may have placed it on the floor where it could hold a door open or closed with its weighty yet humble presence. Perhaps you wanted to keep a particular small stone because you could see an expression, a creature, a character hidden in its contours. That stone may even have become a reminder of a particular person, time, place or dream—a talisman, a touchstone. Stones play such an iconic role in human life. They are used in art, games, gardens, buildings. They are carved, shaped and stacked. They are imbued with stories, meaning, healing powers and identity. Perhaps this is why stones and stone metaphors can be so useful in educational and therapeutic settings. 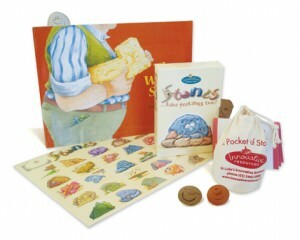 The following ideas are based on a range of classroom activities developed by an early primary teacher using stones and the stone metaphor. Her intention was to create a program of activities that would celebrate diversity and build empathy and inclusion. 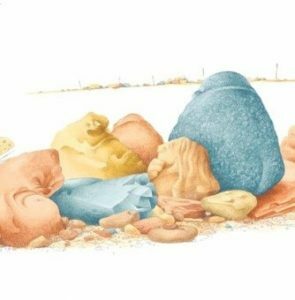 To begin with the class read The Wrong Stone, a much-loved picture book by Russell Deal featuring an odd-shaped stone who thought he would not be chosen for a place in the wall because … he was the ‘wrong’ stone. But then, miracle of miracles … the stonemason picked him up! ‘I’ve been saving you for the perfect spot,’ he said. ‘It’s your job to keep the whole wall together.’ The wrong stone had become the very right stone. The book ends with an heroic double-page spread revealing the whole wall made up of different stones, of various shapes and colours (some look oddly like people or objects you know). During and after reading the picture book the teacher focussed the discussion on the various feelings that the wrong stone experienced. Why did he feel worried? What did he think about the other stones? What did he think about himself? When do you feel this way? How does it feel in your body? What helps most when you feel this way? What was he feeling at the end of the story? Have you ever felt this way? What was it like? Then the discussion can naturally shift to noticing what others may be feeling. Have you ever noticed someone feeling left out, perhaps feeling like they are a ‘wrong stone’? How do you know they are feeling that way? What could you do to help include them or help them feel better? The teacher then drew a very simple wall with a variety of interconnecting stones. (This could be drawn by hand or on the computer.) She made copies of this template and cut out the shapes to create paper jigsaws. In small groups, the children assembled and illustrated their jigsaw wall, depicting different people and things that are all part of their school. This activity is a way of discussing inclusion and diversity. You could do it using other illustrations on the stone wall, such as different plants that make up an eco-system, different ingredients in a meal, different strengths or skills that people contribute in their classroom or school. This activity could be further developed using A Pocket of Stones—a set of 12 ceramic heads in a calico pouch. Each stone shows a face depicting an emotion—sad, happy, scared, and so on. Or you could use Stones … have feelings too! a set of 52 cards with fun stone characters expressing a wide range of emotions. There are possible words for the emotions on the back of the cards for building vocabularies for talking about feelings. The class could reflect on and discuss emotions using some of the cards or the 12 ceramic stone heads. What is each stone feeling? How do you know? Have you ever felt this way? What does your body feel like when you are feeling this emotion? The class could then go outside and each find a few stones to bring back inside and paint with various emotions. Or they could find a single stone to represent themselves and write their name on it, or they could paint a symbol of themselves on their stone (such as a skateboard, horse, football or something else they like). All the stones could then be arranged on a table as a collage of a stone wall where every stone has its place. Each day the stones could be moved around so each stone has a turn in different places in the wall—making sure no stone is ever left out and each stone has a turn as the ‘key stone’ keeping the whole wall together—just like the very right stone! Thanks for this Karen, its always good to share these ideas! Your post reminded me of how I used the book some years ago with a year 4 class in my role as a learning difficulties advisor with the education department in SA. One boy was excluded from the class to a room at another site for 10 weeks due to his ongoing aggressive behaviour. He had very immature self regulation and did not want to lash out. He was mortified at being separated from the class. When his teacher assistant read him ‘The Wrong Stone’ and showed him the little bag of stones he decided he wanted to make every child in his class a special individualised stone. When he came back to rejoin his classmates he went around the room placing each stone on each child’s section of their table. The children were really touched and it was a great way to reconnect I think it showed that it’s the whole class community that is affected and the teacher too but I can’t quite remember if she got her own stone!